The Landes, in south-west coastal France, was marsh land of very poor soil, supporting one sheep per hectare. 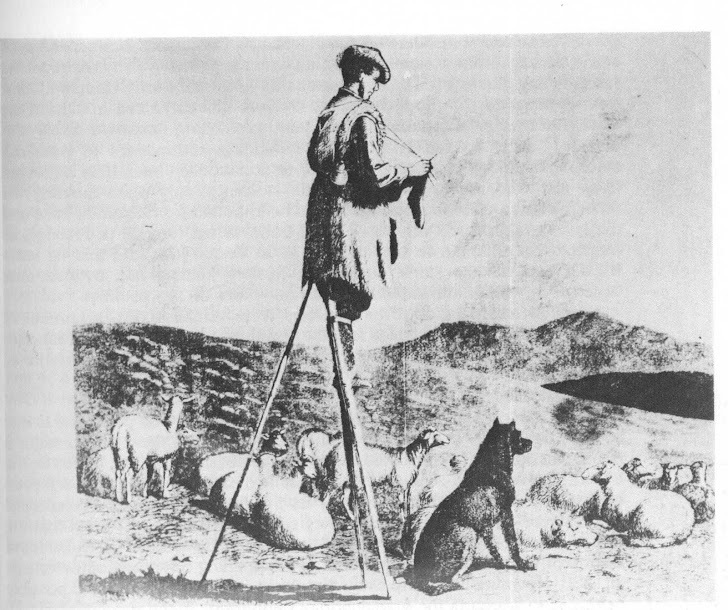 Shepherds used stilts to travel long distances each day to find better grazing for their sheep, and to be able to see them better, as well as keep dry feet. 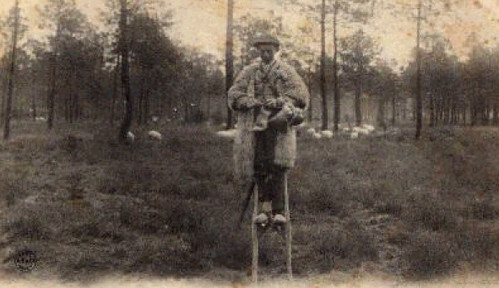 "The shepherds of the Landes spent whole days on stilts, 15 foot ash-wood poles with webbed feet that allowed them to vault across a canal 26 feet wide. They used a stick to form a tripod when they wanted to rest. Perched ten feet in the air, they knitted woollen garments and scanned the horizon for stray sheep. People who saw them in the distance compared them to tiny steeples and giant spiders. They could cover up to 75 miles a day at 8mph (or horse trotting speed). It was such an efficient mode of transport that letters in the Landes were still being delivered by postmen on stilts in the 1930s."